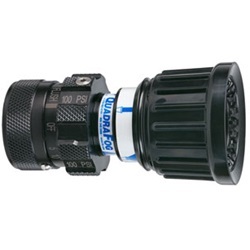 The Quadrafog Series of selectable gallonage 1 in and 1.5 in nozzles are designed for simple operation and rugged durability in wildland or structural firefighting operations. Available in tip only configurations or with a stainless steel ball shutoff and optional color coded nylon pistol grip, these series incorporate lightweight aluminum construction, reflective labeling, and stainless steel components with a protective front rubber bumper. The 1 in Quadrafog Series, with its fixed cut fog tooth pattern is ideal for wildfire operations or booster line operations. The 1.5in Quadrafog Series are available with either TFTs uniquely cut style of fixed fog teeth, or our popular stainless steel spinning teeth to provide a wide protective fog pattern. All models also accept either a low or multi-expansion foam aspiration attachment. All Quadrafog Series ball shutoff models offer TFTs unique quick change rear valve seat that requires no special tools or disassembly of the valve to change the rear seat assembly. The shut off handle can be color coded, laser engraved, and is produced from nylon to withstand harsh operating conditions without breaking or bending. QUADRAFOG TIP 1" NH (25mm) Selectable gallonage nozzle with four flow settings of 5, 10, 24, and 40 gpm @ 100 psi (20-40-90-150 l/min @ 7 bar). All lightweight materials, hardcoat anodized aluminum. Flush without shutting down. This tip-only design has an "off" position for break-and-extend operations. 1" NH rigid thread is standard. 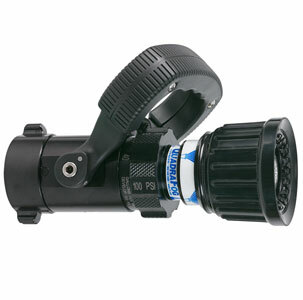 QUADRAFOG NOZZLE 1" NH (25mm) Selectable gallonage nozzle with four flow settings of 5, 10, 24, and 40 gpm @ 100 psi (20-40-90-150 l/min @ 7 bar). All lightweight materials, hardcoat anodized aluminum. Flush without shutting down. Quick-change rear valve seat and stainless steel shut-off ball. Rocker lug 1" NH swivel is standard. 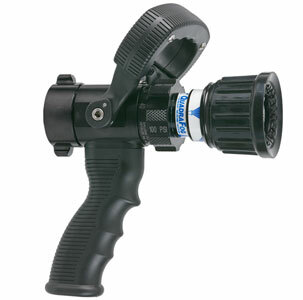 QUADRAFOG W/GRIP 1" NH (25mm) Selectable gallonage nozzle with four flow settings of 5, 10, 24, and 40 gpm @ 100 psi (40-100-150-230 l/min @ 7 bar). All lightweight materials, hardcoat anodized aluminum. Flush without shutting down. Quick-change rear valve seat and stainless steel shut-off ball. Pistol grip is mounted below the valve. Rocker lug 1" NH swivel is standard.